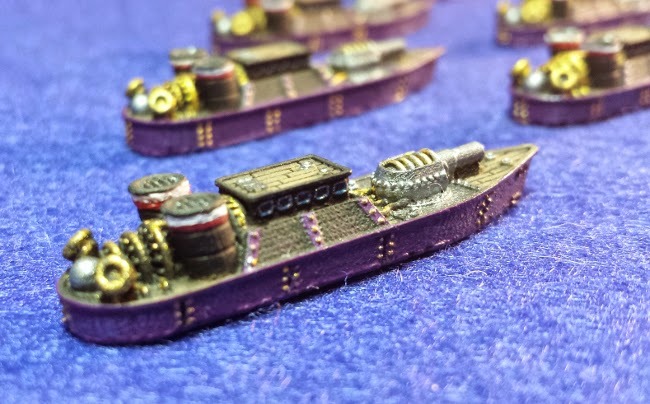 Continuing painting Jeff's Prussian Empire Fleet from Spartan Games Dystopian Wars, the Next ships that I did were the Arminius Class Frigates. He had already painted one, so I had a whopping 8 to finish! Again I tried to copy the style of his frigates, and much like the cruisers highlight the unique features of the class. The Arminius Class Frigates are truly mini versions of the Reiver Class Cruiser. Complete with a cannon in the front, and a Tesla coil in the back.